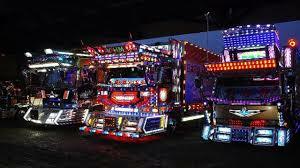 You have most probably seen how people modify their cars to make them more sporty looking but did you know that in Japan there is a whole craze of people decorating and modifying their trucks, from delivery vans to full blown juggernauts these trucks are insanely cool! Owners sometimes spend upwards of $100,000 and years of their life tricking out their trucks with chrome, flashing lights, paintings and that’s just the outsides, it doesn’t stop there. The cabins are also done up with chandeliers, furry seats and I have even seen faux Louis Vuitton panelling. 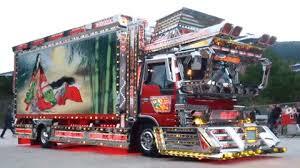 It all started in the 1970s after the release of a movie called ‘Torakku Yaro’ or ‘Truck Guys’ that featured a trucker who drove his garishly decorated truck all over Japan. This movie was a hit with both old and young, and the dekotora fad swept the country. While dekotora were present throughout the 1970s, before the movie they were restricted to the north-eastern fishing transport trucks. In those days, ready-made parts for trucks were not easily available, so these trucks took parts from sightseeing buses or American military vehicles. Since the late 1990s, dekotora have been heavily influenced by the art of Gundam. Other decorations are more akin to modern art and retro designs that closely resemble those found in the movie.